I know I said awhile back that I had found my go-to dessert for this summer. But, I’ve changed my mind! Those salted chocolate peanut butter bars are definitely still towards the top, but I’ve found a new favorite. 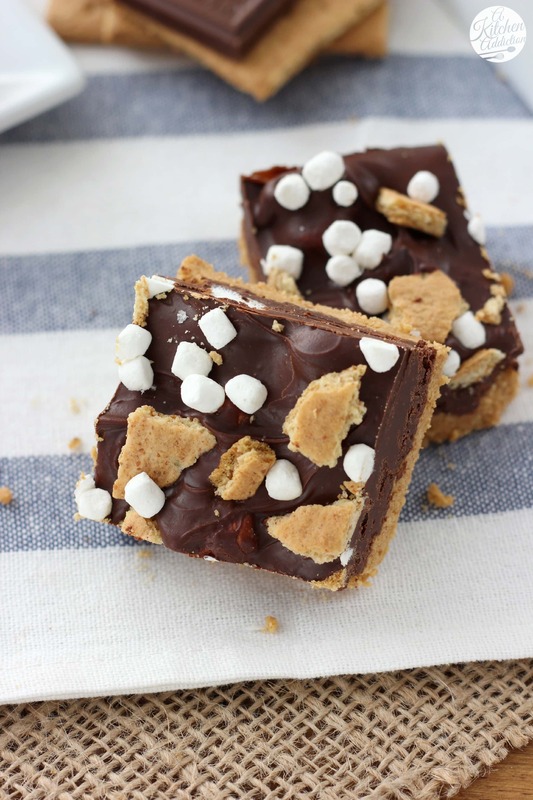 These no bake peanut butter s’mores bars are now number one! When it comes to all things s’mores, I just can’t say no. I’m constantly asking my husband when he’s tending the grill if the coals are just right (because I have to have perfectly toasted marshmallows!) for making s’mores. Fortunately for me, he likes them just about as much as I do so I get to enjoy them quite a bit. I’m thinking it should become an “every time we grill” tradition. It’d be great. Maybe not for our blood sugar levels, but definitely for our tastebuds! These peanut butter s’mores bars are perfect for those days when we aren’t grilling or just about any day, actually. A simple peanut butter graham cracker crust makes up the base of these bars. 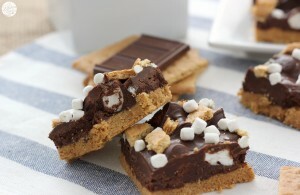 Mini marshmallows are sprinkled over the top and covered with a thick layer of soft peanut butter chocolate. Crushed graham crackers and marshmallow bits finish off these super easy no bake bars. So if you’re looking for a new summer favorite, these bars are it! Line an 8x8 inch baking dish with aluminum foil so that the edges hang over the side of the baking dish. In a food processor, pulse together graham crackers and confectioner's sugar until graham crackers are fine crumbs. In a small microwave safe bowl, melt peanut butter and butter until butter is melted. Stir together and add to food processor. Pulse until mixture is completely combined. Press mixture firmly into the bottom of prepared baking dish. Set aside. In a microwave safe bowl, add chocolate chips and butter. Melt chocolate according to package instructions. Stir in peanut butter until smooth. Top graham cracker base with mini marshmallows. Pour chocolate mixture over the top. 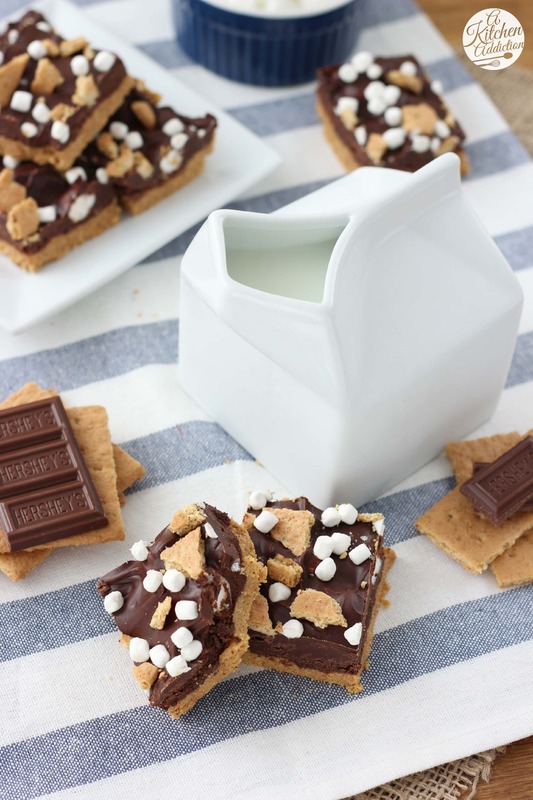 Sprinkle with crushed graham crackers and marshmallow bits. Gently press into chocolate. Refrigerate for at least 2 hours before lifting bars from dish and cutting into pieces. Jessica, these no bakes look AMAZING!! And that ceramic milk container is so cute, I want one!! I sorta wish I could eat these for breakfast. Also I love those super mini marshmallows. They are so crunchy and delicious! I’m on a huge s’mores kick lately, so these bars are calling my name like whoa. Love that they’re no-bake! Oh my goodness, these look delightful! I made s’mores bars last weekend but still baked the graham cracker crust. I am so happy to have a version with no baking required! Wow – what a fabulous recipe. Perfect for summer fun! Oh man, I want to go bake these RIGHT NOW! I love s’mores! I almost bought that ceramic milk container a long time ago and I’m kicking myself now for not doing so because it is so cute! The fact that I don’t have a tray full of these in front of me right now is making me want to burst into tears :'( They look just too amazing! I mean, peanut butter + s’mores? Awh girl, you’re a genius! I’m so loving the sound of these! these sound and look AMAZING!! wow! Peanut butter and s’mores in one??? Absolutely! I love these bars! oh wow- these look perfect! Smores are the bomb! And the only thing that would make them better is peanut butter. Bars are so much easier to transport but you still get that awesome smores flavor! I could do some serious damage with these things in my house. They look amazing! No bake is always a winner here 😀 Pinning! Jessica, these look amazing! I love everything about them. Pinned and sharing on FB later today! We’re about to hit a patch of hot hot weather…and I’m in need of a good no-bake recipe. Can’t wait to try these! These bars look amazing! 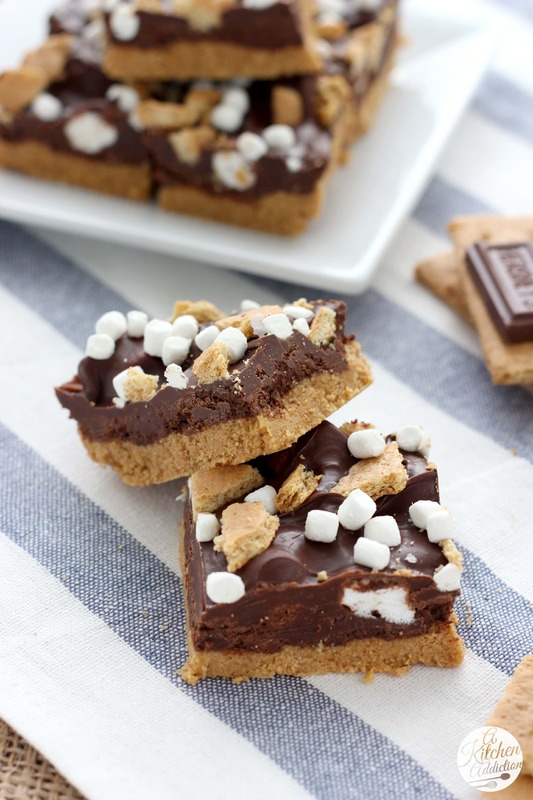 Love s’mores and with peanut butter and no bake – they sound perfect! These look amazing!! A huge bonus that they are no bake! ooooh s’mores from the grill! brilliant! I looove s’mores too so I am so happy you shared these bars! The PB is such a tasty addition too! Oh, and where did you get that little ceramic milk jug from? Either way, I bet we don’t get them here, so could I be super cheeky and ask if you’d be willing to pick one up for me and ship it over? I’ll pay for the goodies, shipping and your time, of course. Let me know if that’s OK Jessica, just email me at the email address provided with this comment. Thanks mi’lady. I just want to reach into my computer screen and grab one of these chocolate beauties! delish!